With the release of iOS 4 continuing on through iOS 6, a new multitasking ability was brought to iOS and the iPhone, iPad, and iPod touch. Basically, multitasking means you can run multiple applications at the same time, which is a standard feature of modern desktop operating systems, and that feature is now ubiquitous in the mobile world as well. 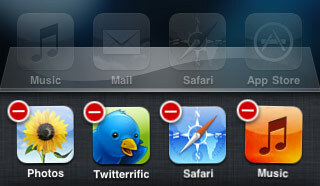 If you are skilled with multitouch, you can actually quit multiple apps at the same time by simultaneously pressing on every one of the red close buttons. The multitask bar serves as an iOS app task manager of sorts, though it’s much more limited than what you’d expect on the desktop side of things. Do note that modern versions of iOS can still quit multitasking apps, you can learn how to exit out of running apps in iOS 7 and 8 here with the assistance of a swipe up gesture from the multitask panel. But should you quit all apps that are running in the background? I thought that the list you see are all RECENT apps, not just all RUNNING apps. When I cleared the entire list, I had to setup my visual voicemail again, for example. Makes me think that some apps are meant to be running in the background all the time. How about, say, Facebook? When you close that, will you still get push notifications? Facebook has had push since before iOS4 was even released, so yes. Push is independent of the multitasking process. Anyway, what most people don’t seem to realize is that closing apps in the background simply isn’t necessary, they’re stored in the RAM so they don’t use any CPU, nor do they waste battery life. If the iPhone/iPod runs low on RAM it’ll automatically close the last app in the menu.